As a native of Germany, Aki has missed the bread, rolls, pastries and baked goods that he grew up with. Since 2010, He has been working to bring back memories, the taste and the smell of the freshly baked goods of his home country. Aki's Breadhaus is located in Northeast Minneapolis and serves up pretzels and baked goods at many local eateries and microbreweries. 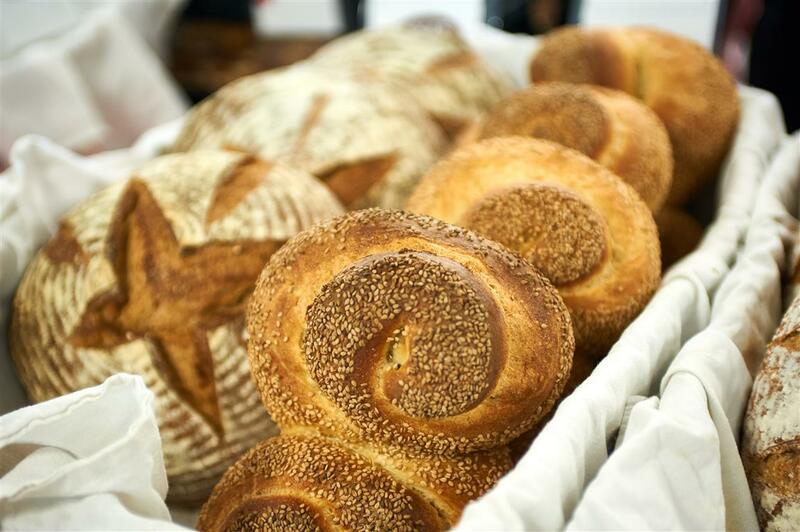 Find Aki's artisan breads, rolls, and pretzels at all indoor markets in November-December 2018 and March-April 2019. 2018 brought a great new flavor profile to the market: authentic South American baked goods and entrees from Atacama Catering. We're pleased to welcome Ivette and Yuraj to the indoor markets. Find fresh salsa plus an array of specialty baked items including alfajores, kuchen, and churros. 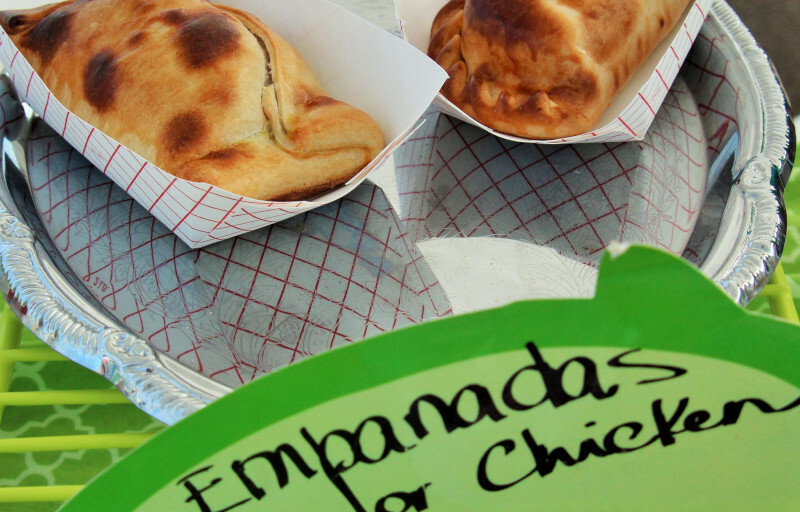 Hot empanadas and shepherd's pies, too! Find Atacama Catering at each of the indoor markets in November-December 2018 and March-April 2019. 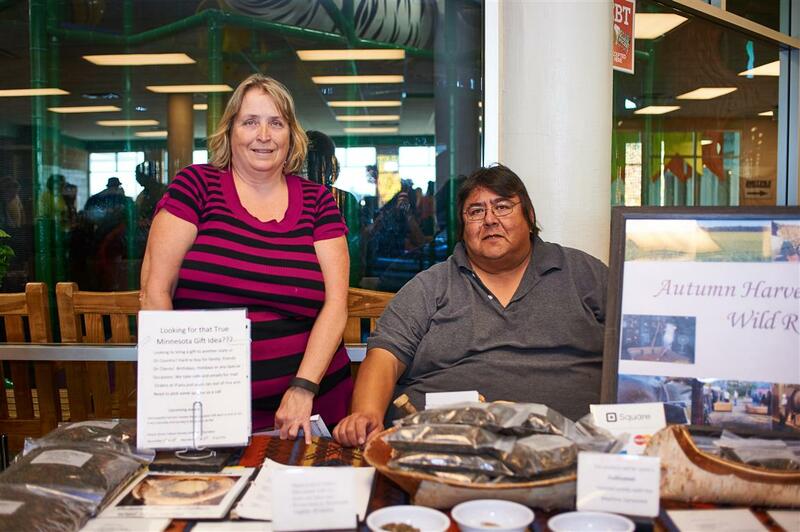 Ronda and Randy Beaulieu are proud to offer wild rice that is hand-harvested by members of the Ojibwe Nation. The rice is then "parched" or finished, in Sawyer, Minnesota. Traditional wild rice is dramatically different than paddy-grown "cultivated" wild rice and offers a true taste of Minnesota. Stock up on wild rice for your pantry and for gift-giving on November 15, December 6 and December 20, 2018 at the indoor markets. Coco, Bee and Nut grew out of Kathryn's love of baking, helping others, and promoting a healthy diet. Working at coffee shops, she discovered the enjoyment of making granola. One day she decided to take the oats out of her recipe for a friend who was following a low-carb diet. The rest is history! Kathryn's grain-free/gluten-free granola is made with local wildflower honey, making it a low-glycemic food. 10% of all sales are donated to charity. Dessert first? Yes please. 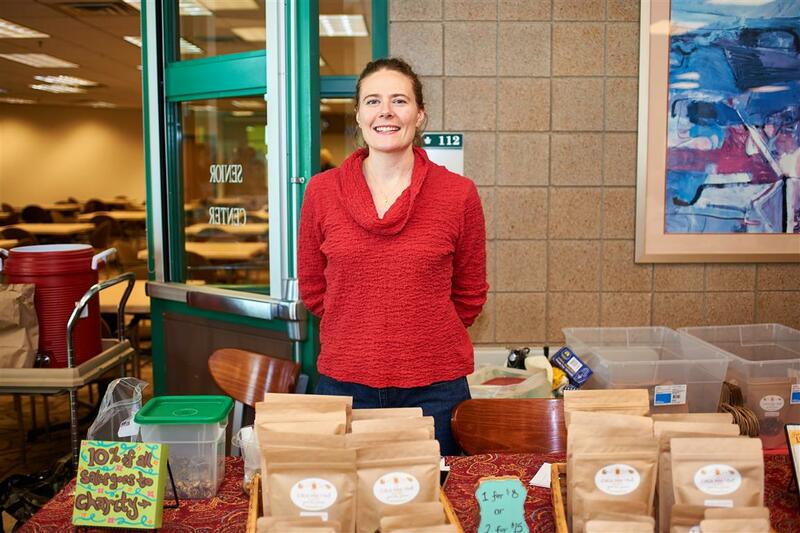 Christine Myhre is pursuing a long-deferred dream of running her own baking business. 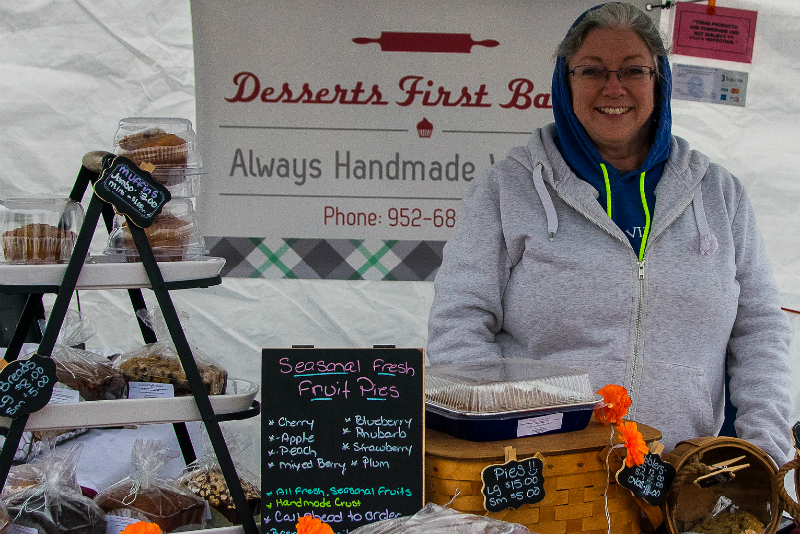 She started baking for her parents at their farm market in Rochester, NY almost 30 years ago. Find a wide variety of from-scratch goodies at the farmers market, including pies, cookies, cakes, scones, quick breads and bars. Jimmy Bauman and Heather Lewin lovingly farm two acres near Delano, MN. In November and December of 2018, Farm Farm will offer a beautiful and delicious mix of fresh root vegetables, greens, and storage crops grown using organic methods. Heather and Jimmy cultivate over 100 varieties of produce and sell through CSA shares and at several local farmers markets. New to the Maple Grove Farmers Market in winter 2018-2019, Finca ElMar Coffee Co. offers sustainably-grown beans and ground coffee from the picturesque mountains of Olancho in Honduras. Sally and Jeff Gardner grow chemical-free produce on three acres near the Mississippi River in Monticello, MN. 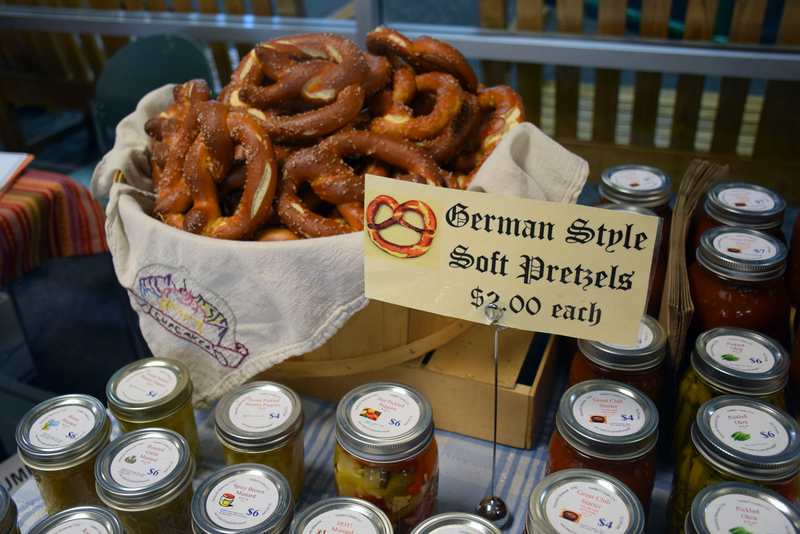 Longtime members of the Maple Grove market community, they also offer a wide variety of canned home-canned goods (fan favorites: mustard, sauerkraut, and chili starter) as well as German-style pretzels. Find Gardner's Garden at all indoor farmers markets in Nov-Dec 2018 and March-April 2019. 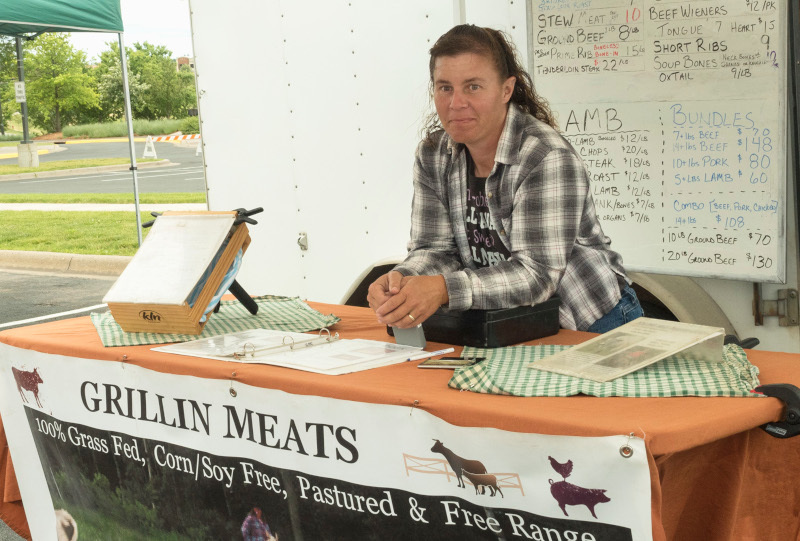 Christina Traeger and her family began raising livestock in 1996 and have been selling at farmers markets since 2009. They love their work raising grass-fed and pastured livestock and poultry near Avon, Minnesota. Grillin' Meats is a corn- and soy- free farm. "We developed our sustainable and eco-friendly production system keeping future generations in mind." Christina loves connecting with the people who use her products through the market. Scott Graham, owner of I Got Cheese, has deep roots in Minnesota and in the cheese business. His great-great grandfather was the first treasurer of the Minnesota Territory and the very first check issued bears his name. Scott began connecting Minnesotans with great cheese as the manager of The Cheese Shop of Wayzata in 1974. 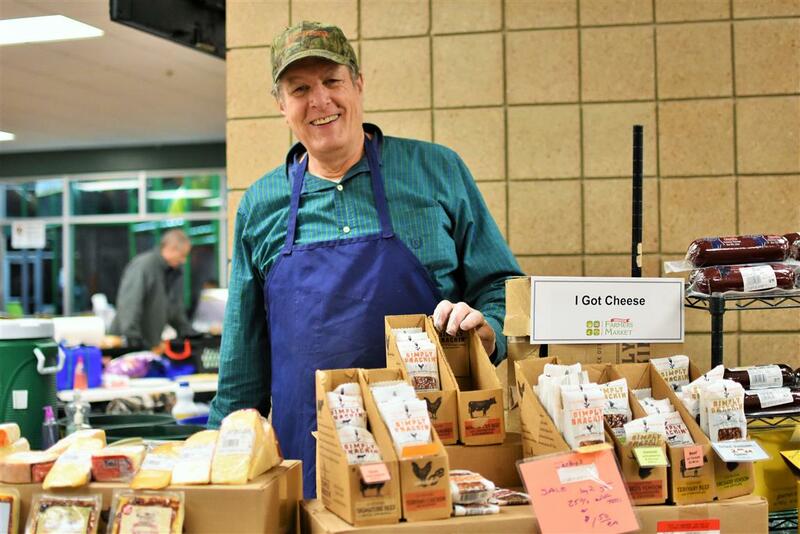 After 28 years of representing Wisconsin cheesemakers at Chicago-area farmers markets, Scott moved back to Minnesota. He enjoys supporting the wonderful co-ops and cheesemakers of southwestern Wisconsin. Loyal fans will be happy to find Scott at market on November 15, December 6, and December 20 2018. After decades-long careers in the restaurant business, Jon and Nicole have launched a new retirement venture: JB's Homemade at its Finest. 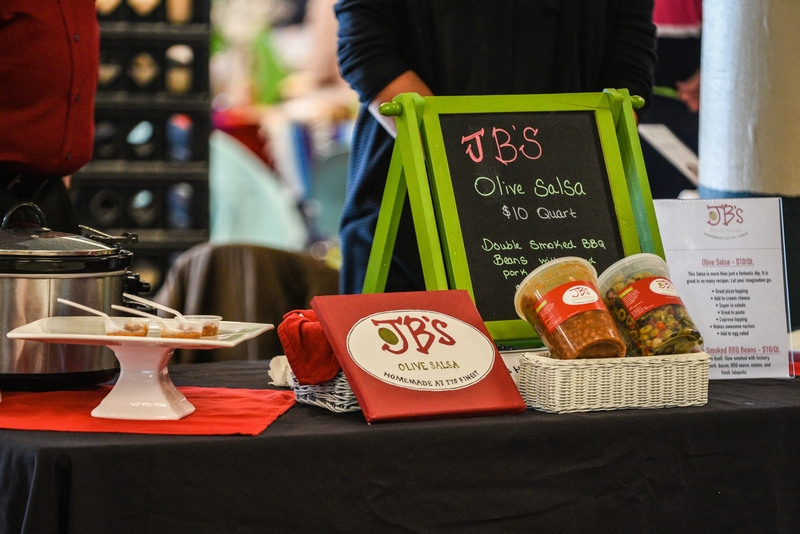 The Bormans offer unique ready-to-eat olive salsa and double-smoked baked beans to an enthusiastic and rapidly growing customer base at the market. Sample and buy their products at all indoor market dates in November-December 2018 and March-April 2019. 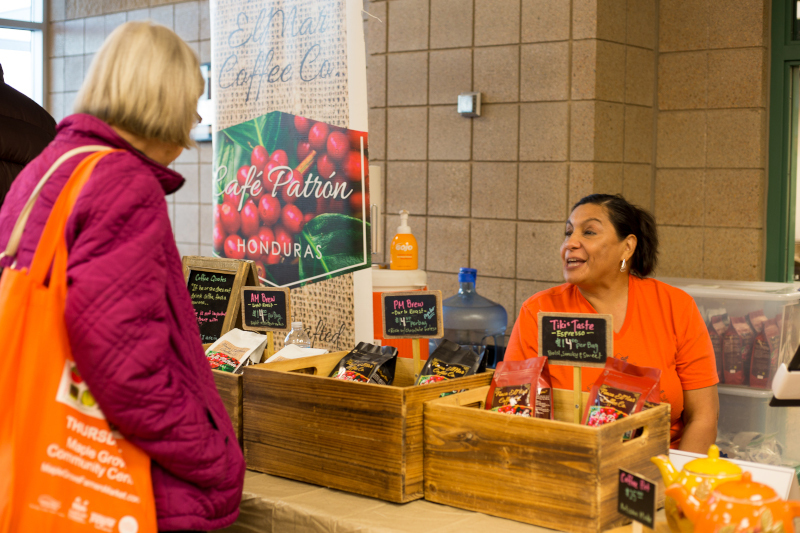 "Live, Laugh Love" is the motto of Martha's Joy, an eleven-year member of the Maple Grove Farmers Market community. David Jackson offers a wide assortment of unique vegetable pickles made with the freshest local ingredients. Stock up for gift-giving and for your holiday relish trays! Martha's Joy was founded by David's wife Martha in 2004 using recipes passed down from Martha's mother and grandmother. 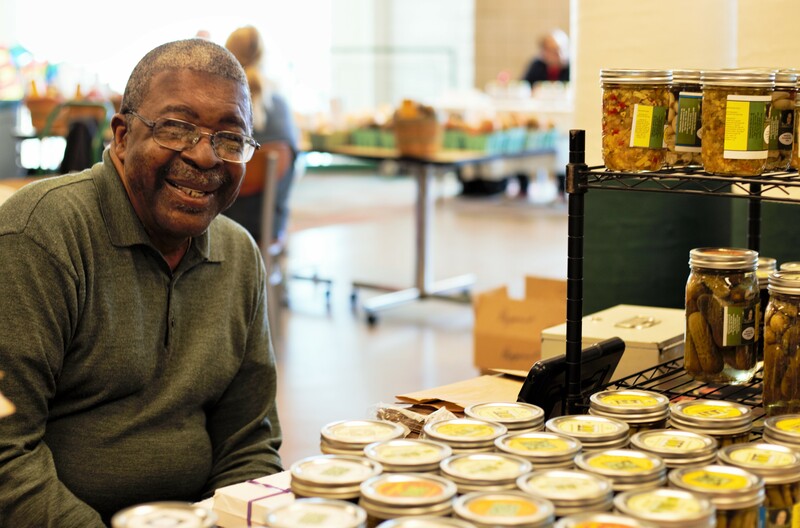 Pickles and joyful community connection are the legacy of Martha Jackson, who passed away in 2014. Visit David for a sample, a kind word, and a smile. The Mau family specializes in heirloom tomatoes, unique melons, and a wide variety of winter squash and pumpkins. Based in Maple Grove and growing in Winsted and Jordan, MN, their stall is a great example of what makes the market unique. 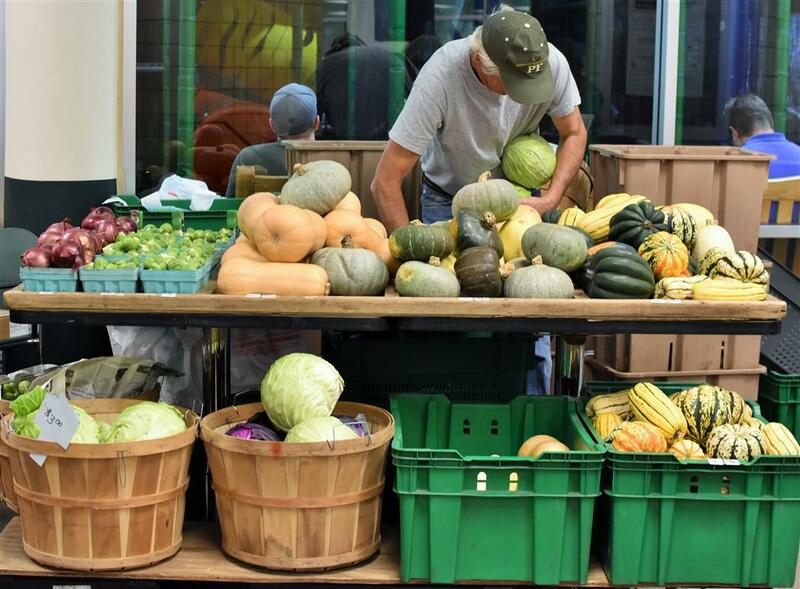 John and Anna will bring a wide variety of winter squash plus heirloom tomato juice and pepper jelly to the November 15, 2018 indoor market. 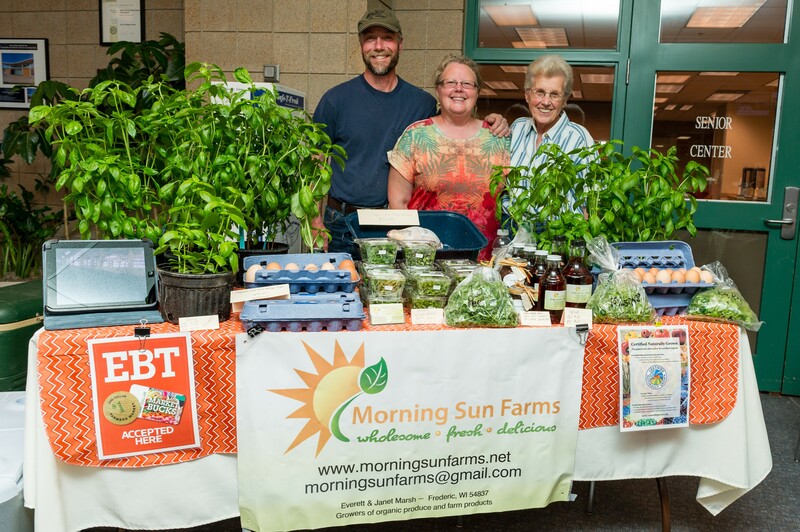 Janet and Everett Marsh of Morning Sun Farms began growing food commercially in 2012 and have been part of the Maple Grove Farmers Market since 2013. They are passionate about clean, chemical-free, and healthy food and have sought and achieved certification of their practices by Certified Naturally Grown. Each week find a variety of fresh, seasonal vegetables along with eggs, chicken, and maple syrup from their farm in Frederic, WI. 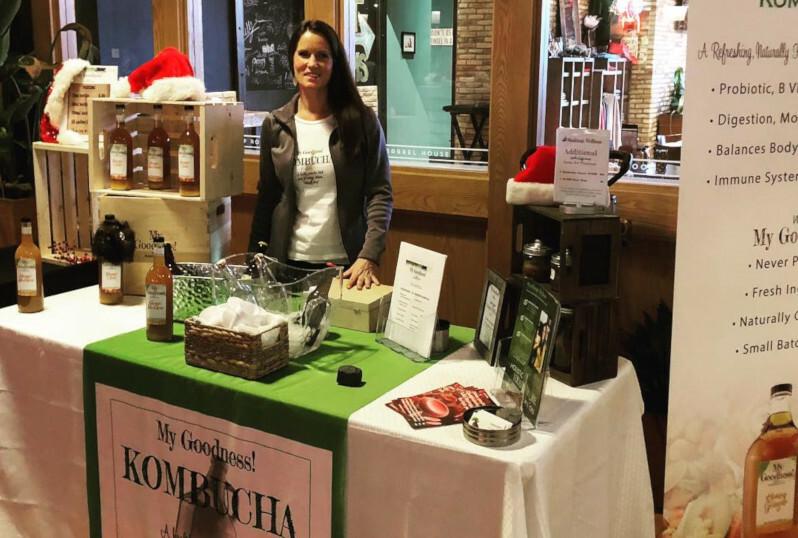 The market is pleased to welcome Rachael KraMer of Andover, MN, offering unpasteurized kombucha in a number of tasty flavors, plus kombucha starter (SCOBY). 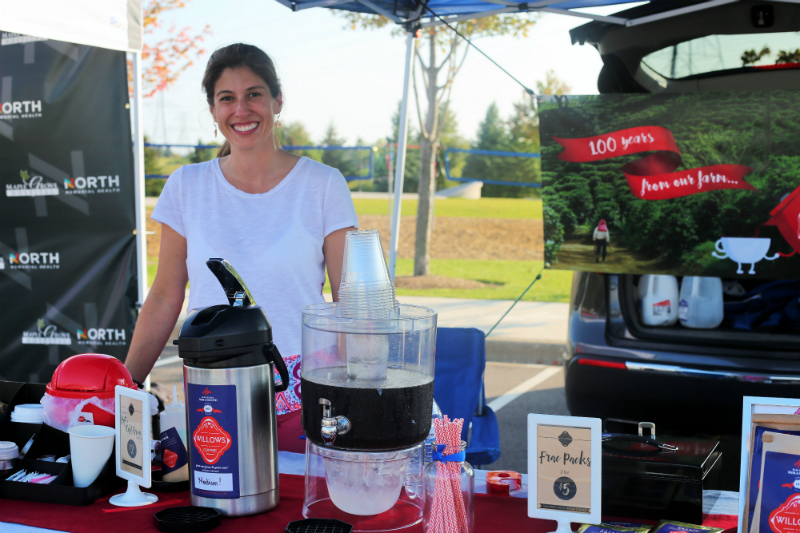 Rachael brews her kombucha using local ingredients, including herbs from her own garden during the growing season. Year-round flavors include Mango Madness, Honey Ginger, POM Ginger Pucker, Blueberry Cumin Zip, Toxic Ninja Shocker. When Natasha and Vlad Obuhov discovered the difficulty of finding good frozen pierogi in the grocery store, they began to make their own. A business was born! Find over 20 varieties of this traditional Eastern European delicacy in their freezer case, along with frozen entrees such as dumplings, borscht, beef stroganoff, cabbage rolls, and savory garlic-ginger dipping sauce. Pierogi make an easy, delicious, kid- and crowd-pleasing appetizer or entrée in any season. 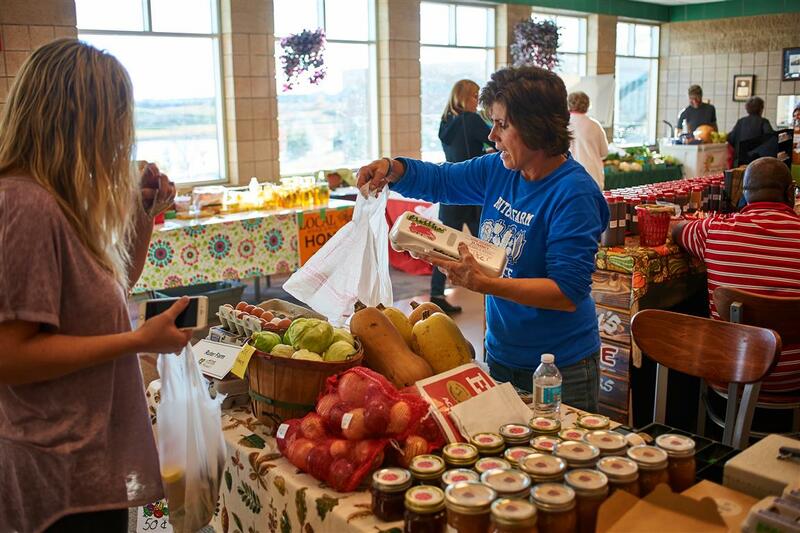 The Neumann Family helped to found the Maple Grove Farmers Market in 2004, and have been a fixture ever since. Ron and Joyce have been married for 44 years (congrats!) and are joined at market by their daughter Tina and Joyce's sister Carol. 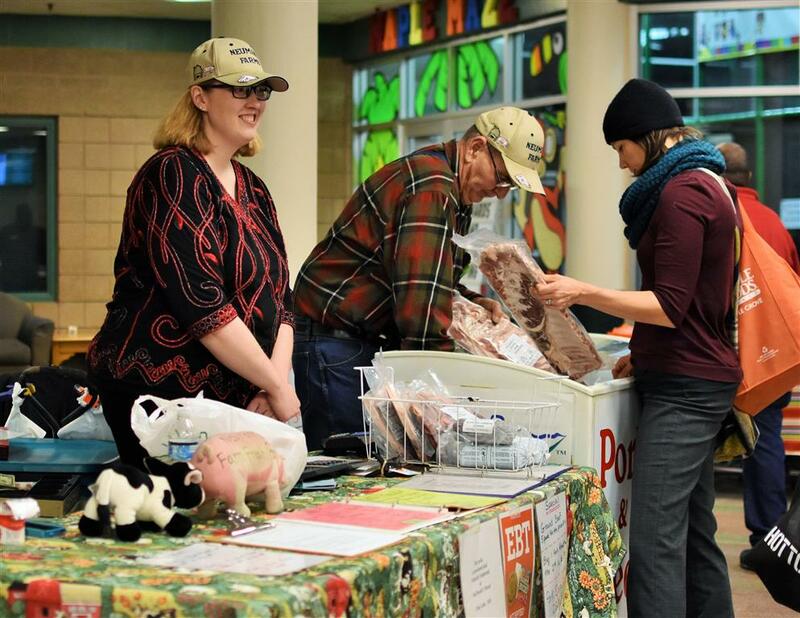 The Princeton, Minnesota family raises all of their hogs and beef on their own second-generation family farm without antibiotics or artificial hormones. Joyce also bakes up a variety of tasty quick breads using homegrown produce and low-fat, low-sugar recipes. Holiday hams, hearty roasts, crisp bacon and delicious brats are available by visiting Neumann Farms at each and every 2018-2019 indoor market. Nonna's Best antipasto is a family recipe that dates to owner Dina Swanson's grandmother. Dina joined the market in 2016 and is pleased to honor her mother and keep the tradition of antipasto alive in her family.The special blend contains seven different vegetables. It is gluten-free and contains no sulfites or MSG. 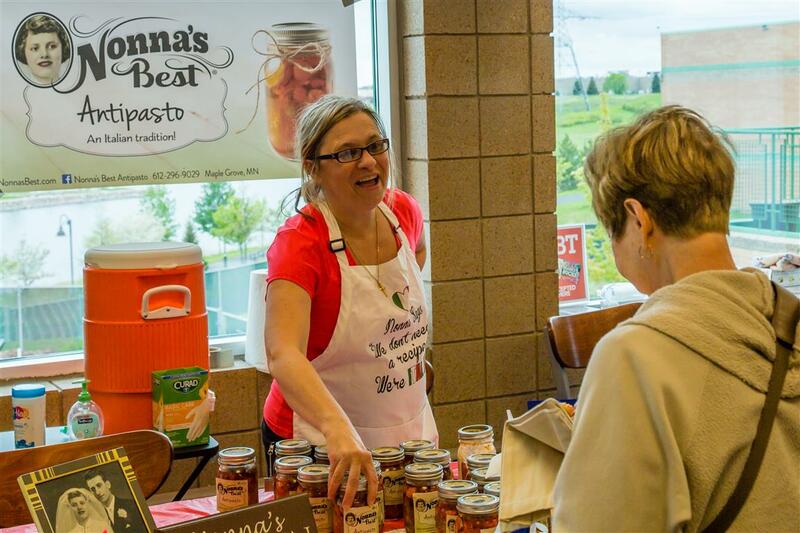 Stock up on antipasto during the April 2019 indoor farmers markets. 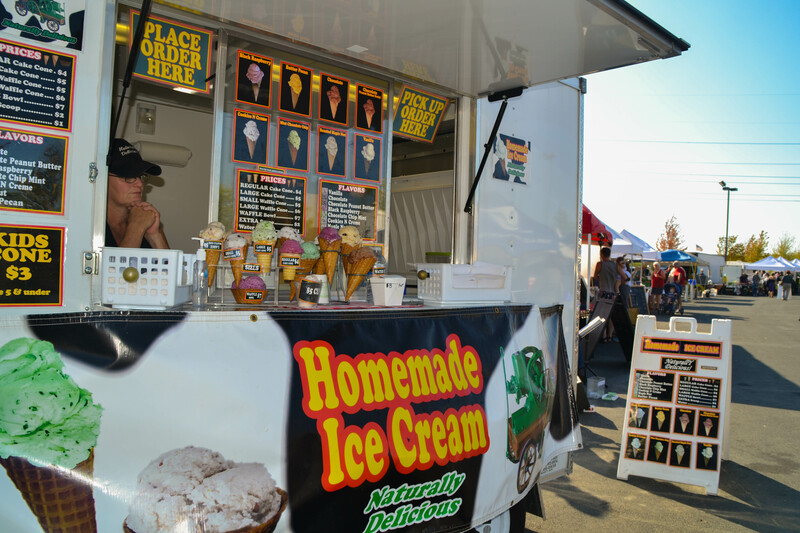 Ruhland's Strudel Haus began in 2002 as food concession at art fairs and other Twin Cities events. The business has grown and now offers over 39 varieties of sweet and savory frozen take-and-bake strudels, made with love and utilizing locally-grown produce items wherever possible. We're thrilled to welcome Tom back to the indoor market after several years away. Paul and Dee Ruter and many members of the Ruter family have been part of the market since 2007. Visit their indoor farmers market stand in December 2018 for farm-fresh eggs, winter squash, miniature pies, and homemade jams and jellies. Their farm is situated in sandy soils just above the Crow River in Hanover, Minnesota. 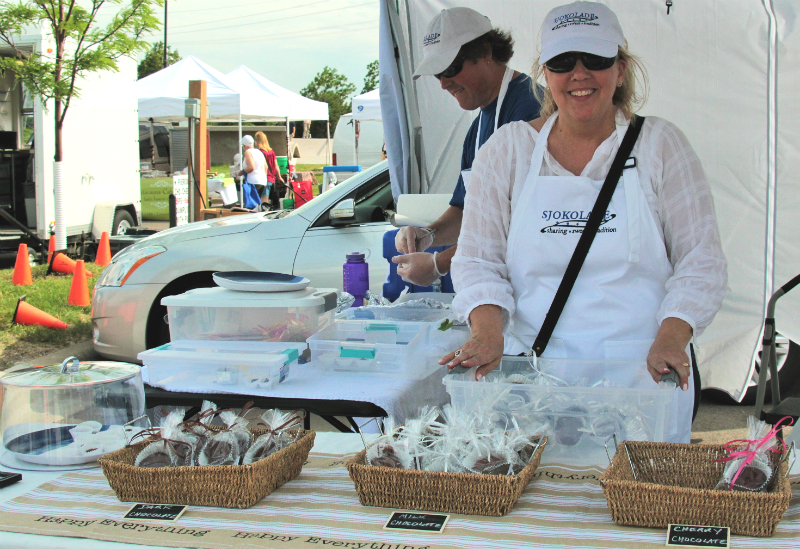 The Schwartz family has been a part of the Maple Grove Farmers Market since 2004--our very first year! Stop by their indoor or outdoor stand and you'll be greeted by three generations of the family working together. Growing in Andover, Elk River, Lino Lakes, and Harris, the Schwartzes offer a full line of local vegetables.Indoor cold storage facilities allow them to offer root vegetables, squash, and other storage crops throughout the winter months. 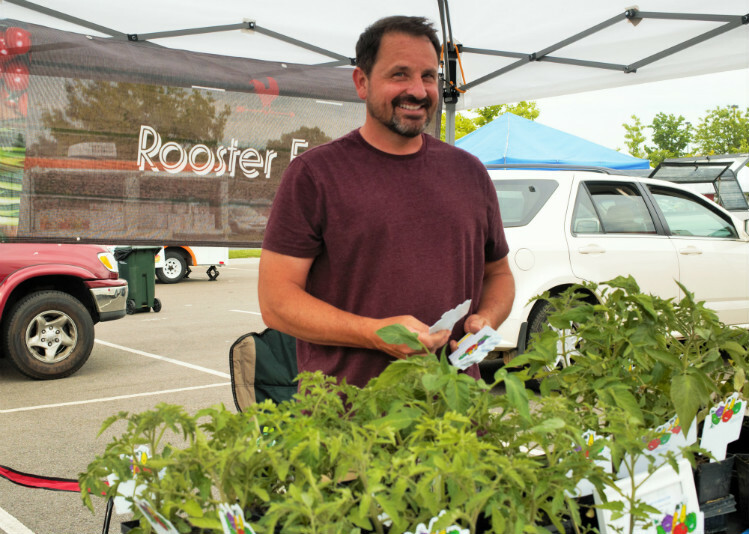 For Rich and Chris Schyma, the farmers market business has always been about family. 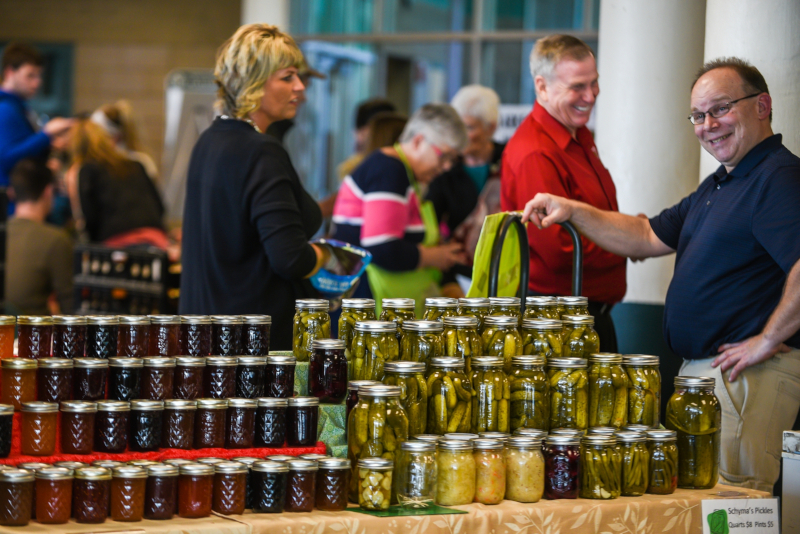 With their five sons, the Schymas sell pickles, jams, and home-grown chickens at the Maple Grove Farmers Market and Monticello Farmers Market. "As the boys have grown up, they have learned how to talk to people, work hard, and the ups and downs of running a business. As parents, we have spent countless hours working with our boys and have made memories that will last forever." Silver Lily Sweetery is a ‘from-scratch, small-batch’ home bakery locally operated by Ashley Boeshans. With her launch in 2015, Ashley realized her dream of selling beautiful every-day and seasonally themed goodies; specializing in uber-creative royal-iced cookies, artisan cupcakes, brownies and bars. Stop by to enjoy Ashley's seasonally-themed goodies at each of the indoor markets in November-December 2018 and March-April 2019. There is a charming story behind the fudge at SJOKOLADE. Owner Jonica’s love of celebrating life’s special occasions (and fudge), came from her precious Norwegian Grandmother. Her grandmother always had a beautiful table set, amazing food, and during the holidays the dessert table always included her fudge! The company was named SJOKOLADE, meaning Chocolate in Norwegian, in honor of Jonica’s grandmother. Jonica has lovingly tweaked her grandmother’s recipe through the years. Jonica hopes you will enjoy sharing this sweet treat with friends and family and create new traditions of your own! "Local" is truly the best descriptor of Ken and Sandy Tschannen's products. Their diversified 15-acre farm (sheep, horses, vegetables, sugar maples, and 50 hives of honey bees!) is the only MGFM supplier that is located within Maple Grove City limits. A fixture of the market since 2009, Ken and Sandy say they truly believe in a pure, natural approach to managing their property. Their vegetable growing operation is certified organic. Their hives are not treated with any chemicals and the honey is left in its raw state. The Tschannens have earned over 70 Minnesota State Fair ribbons and have been named State Fair honey Sweepstakes winners five times. 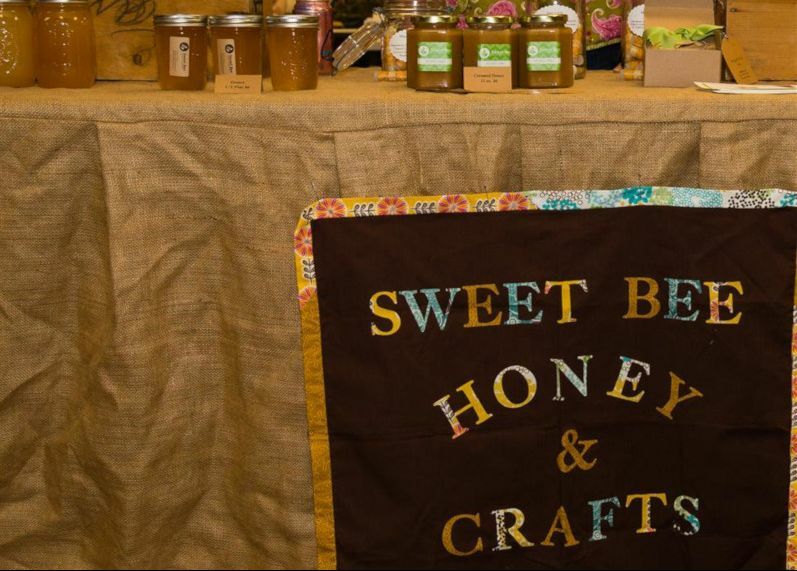 Myla Meier of Sweet Bee Honey and Crafts has been a Maple Grove-based hobby beekeeper for seven years and a friend of the Maple Grove Farmers Market for just as long. Discover her MN State Fair award-winning local raw honey and beeswax candles at all 2018-2018 indoor farmers markets. Tom and Karen Carinci originally hail from southern New Mexico and have been making their authentic salsa for friends and family for years. 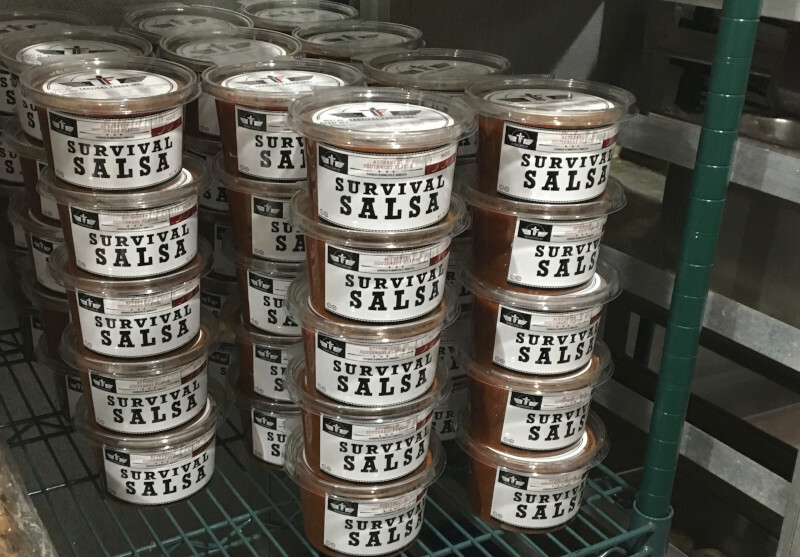 Their fresh salsa comes in two flavors--Survival (hot!) and Rookie (medium.) It contains no preservatives, MSG, or added sugars. Taste the sunny Southwest when Tactical Foods joins the market on March 21, April 4, and April 18 2019. Thirteen years ago, Larry Bigelow’s daughter, Stacie, began a business making glycerin soaps, lotions and lip balms. Stacie persuaded her father to help with the business and Larry has never looked back. All of their soaps are made from natural products and ingredients. Larry is 80 years old and has been married to Olene for 53 years. He also has two daughters and two cats. 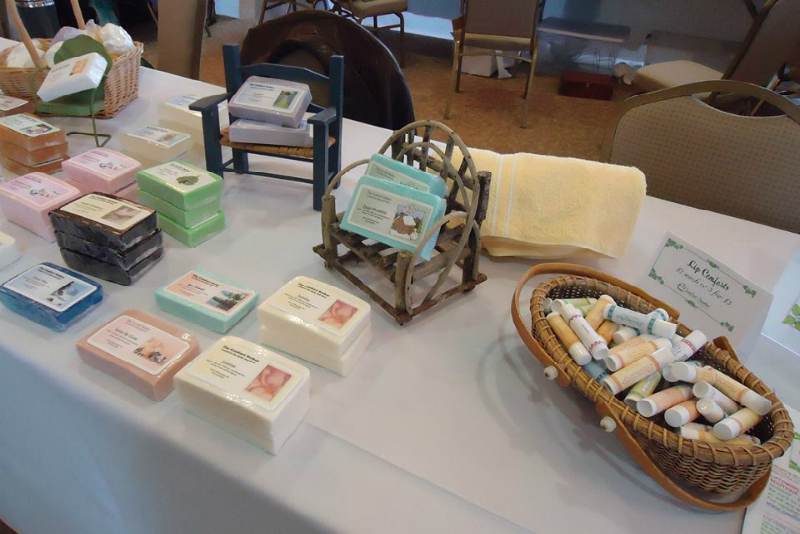 Stop by the winter market on March 21, April 4 and April 18 to experience the quality, color and fragrance of Comfort Seeker soaps. "Have you ever wondered how good salmon would be if you could go to Alaska and buy it from the fisherman? Well, that's us! If you buy fish from Wild Run Salmon, I caught it... If I caught it, I took care of it because well....I'm the guy selling it to you." Matt Oxford spends a portion of each year fishing the Upper Cook Inlet in Alaska with his sons George, Sam and Leo. He custom-packs his own fish by flash-freezing it within hours of being caught. 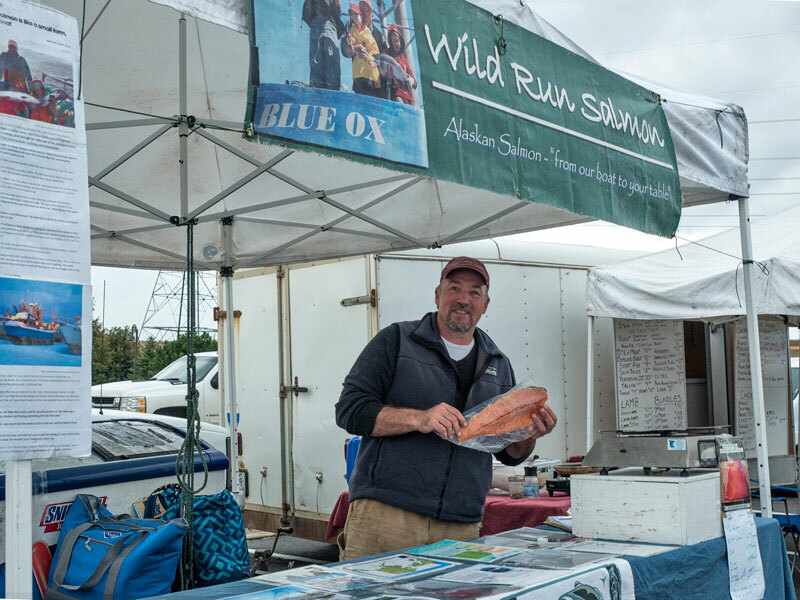 Enjoy Matt's wild-caught salmon and cod on select indoor and outdoor market dates. 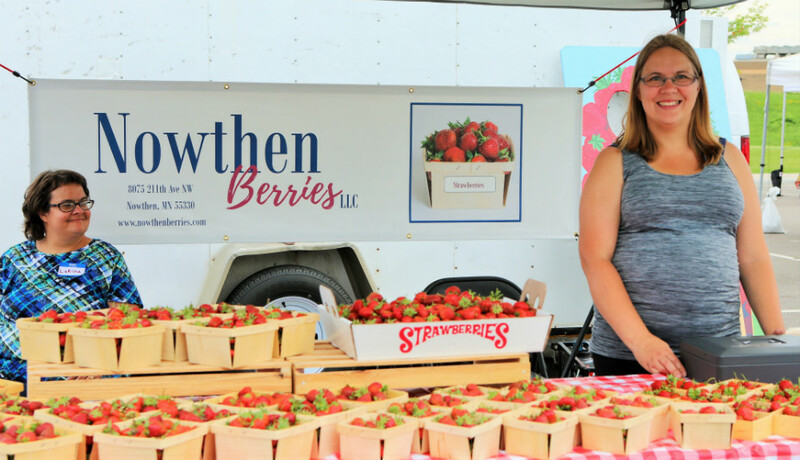 Rabideaux's Bayfield Fruit Company was established in 1963 and has been selling strawberries, raspberries and blueberries at the Maple Grove Farmers Market since 2014. 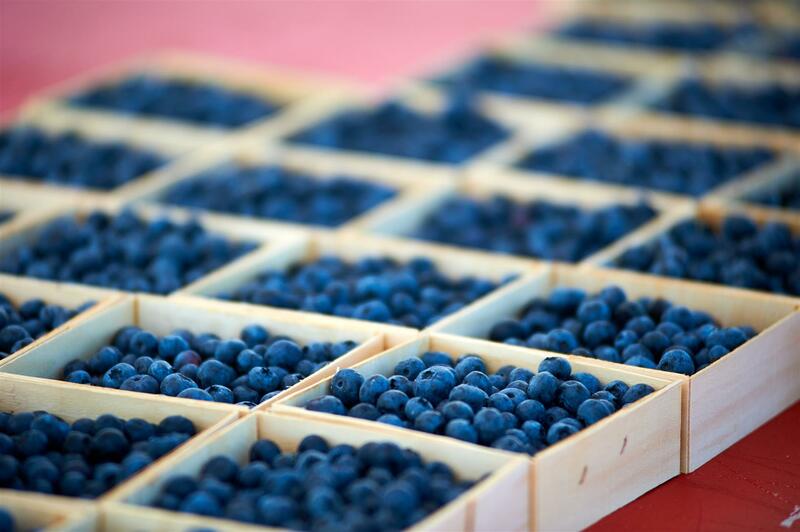 Located in Bayfield Wisconsin on the south shore of Lake Superior, the farm enjoys microclimates which enhance the flavor of the fruit.Look for strawberries in late June/early July, raspberries in July, and blueberries in August. Outside rather than inside -- that's how the Beck family prefers working ever since Jim Beck's grandfather Orville started the farm in 1959. With three generations working the farm, they enjoy a unique way of living with a lot of hard work and excellent food. Even after almost 60 years, all produce is handpicked, and even hand weeded sometimes. Vendors at Maple Grove since 2008, the Becks enjoy meeting new and really nice people at the farmers market. eQuality - Pathways to Potential is a community based program that assists developmentally disabled adults with finding and maintaining competitive and contracted employment. eQuality Farms, an 11-acre certified organic farm in Buffalo, MN, employs a crew of eight adults as well as providing therapeutic-educational opportunities to 40 individuals.At eQuality Farms, associates plant, nurture, and harvest organic vegetables and flowers through both field and high tunnel production. 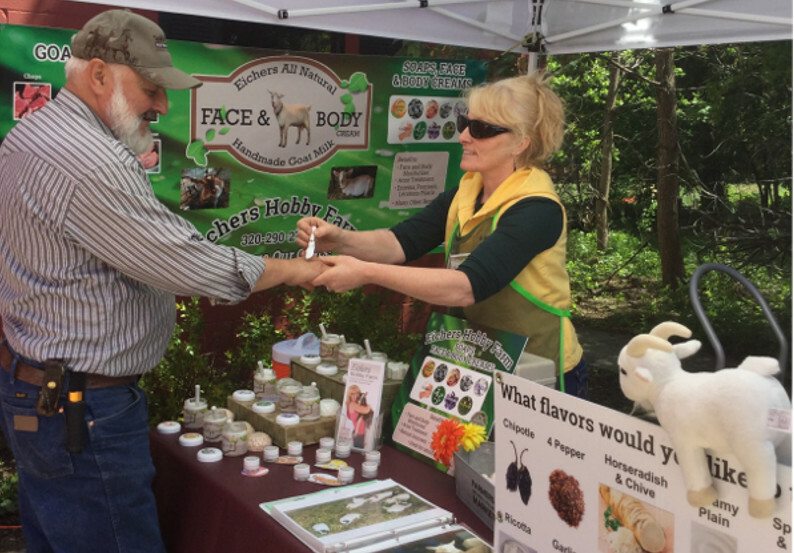 John and Karen Berglund of South Haven, MN are the team behind JK Bees, offering a unique set of farmstead products to Maple Grove shoppers since 2016. Karen creates unusual flavors of jelly featuring honeyberries, aronia berries, and other fruit jellies. 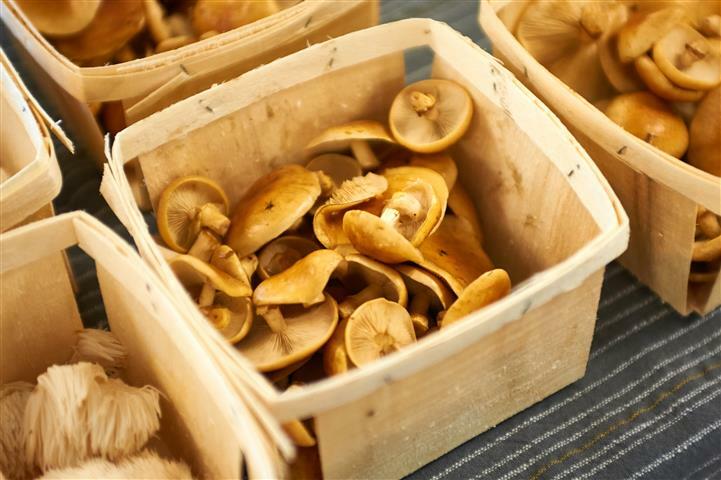 John became intrigued by the process of growing mushrooms after taking a class in 2011 and offers a rotating variety of mushrooms, plus fresh produce and farmstead eggs. 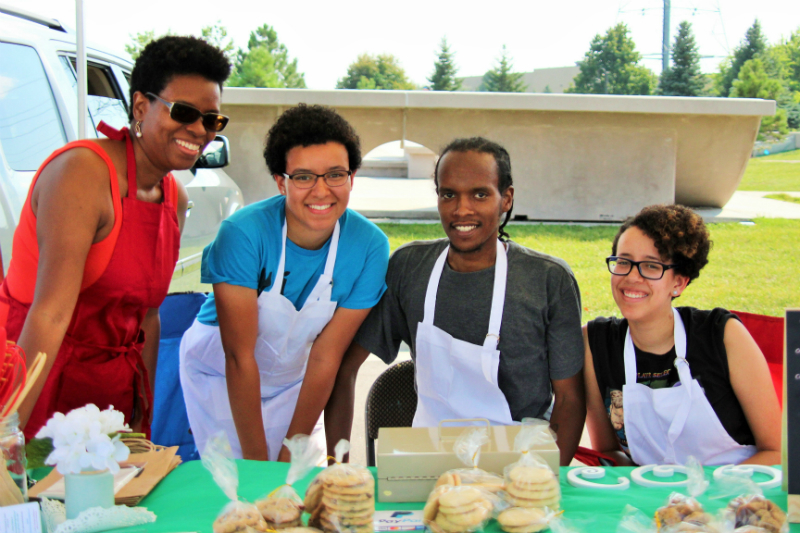 The Berglunds take pride in connecting directly with customers at market. 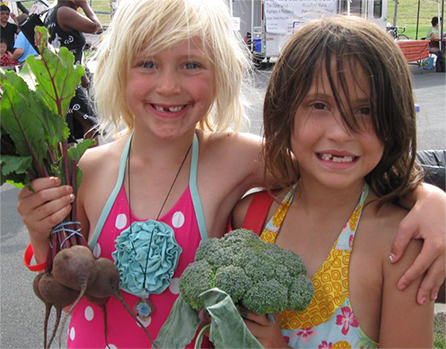 The family that farms together…is at the farmers market together. 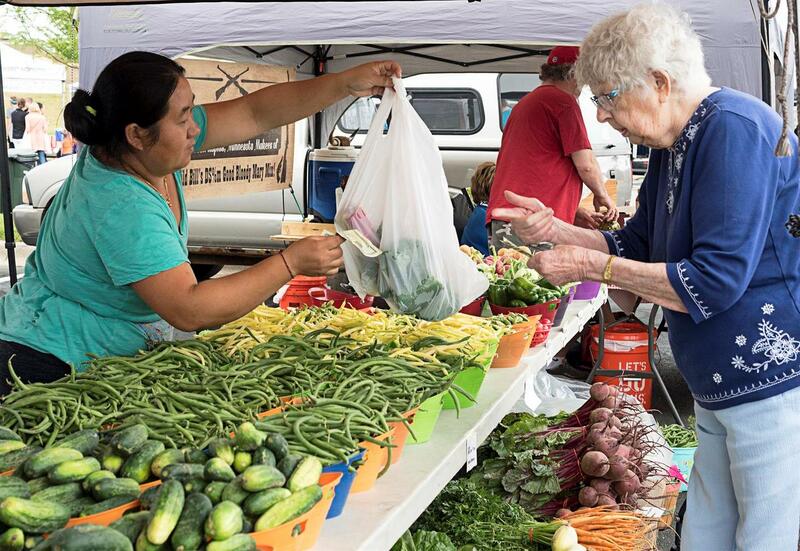 With the Lee family, you'll find mothers, daughters, sisters, and aunts in the fields daily and at their market booth weekly. They have a strong tradition of hard work and pride that is reflected in the wide array of fresh produce they offer. And, they have a knack for encouraging shoppers to try something new. Dave Nelson and his family are the smiling faces behind the Nelson Family Farm. Located in Big Lake, MN, Dave is continuing the work of his family and hopes to keep the farming tradition going with his children. Their specialty? The tomatoes that they grow in their greenhouses! 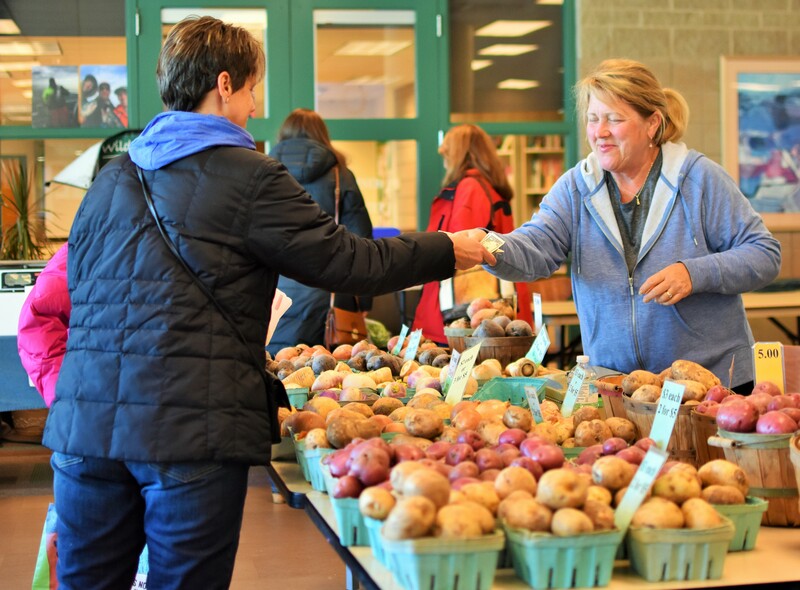 They’d love to meet you and get to know you – be sure to stop by and say hello during your next visit to the farmers market. Nowthen Berries is a family farm based out of Nowthen, MN. Dan and Miranda started growing berries in 2016 and joined the market in 2018. They want to provide you with the cleanest, most delicious strawberries, so all their products are grown without herbicides and pesticides – they even do all weeding by hand! Be sure to stop by and say hello next time you’re at the market. They would love to hear how you are enjoying the berries! Rainfall Farms offers a variety of fresh leafy greens and herbs. Their farm started out of their kitchen and now they have their own grow building location in Hanover. Their unique aeroponic system allows them to grow produce year-round using filtered water and natural nutrients. Stop by to pick up some fresh produce and herbs and chat with them to learn more about their growing process! Betty and Tom began Rooster Farms right here in Maple Grove! 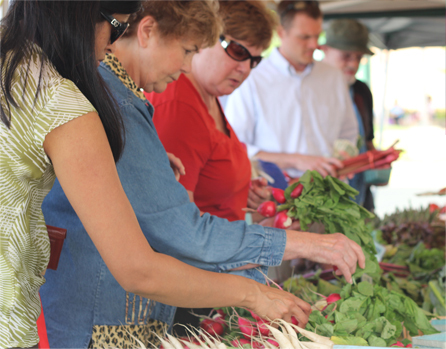 Visit them at the market and you will find local produce – mostly tomatoes and lettuce. What’s unique about their farm? They grow food and flowers in an urban setting. Betty and Tom are passionate about buying local and farm grown produce in their community. 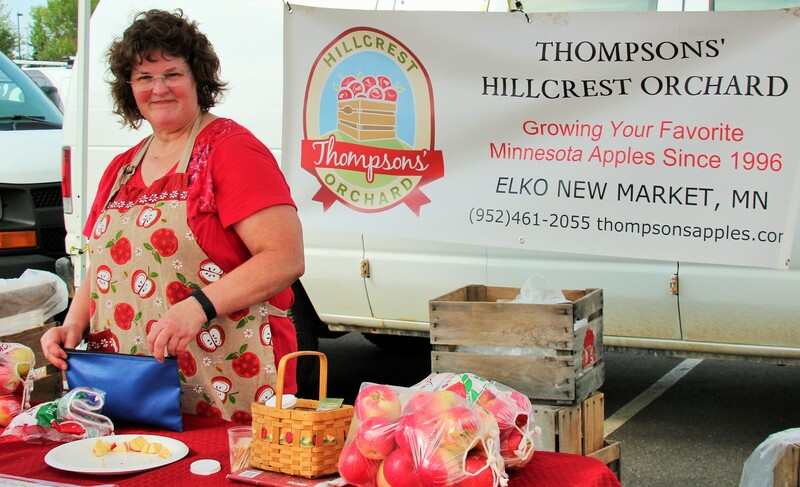 Stop by next time you are at the market to pick up some of their certified Minnesota Grown produce! 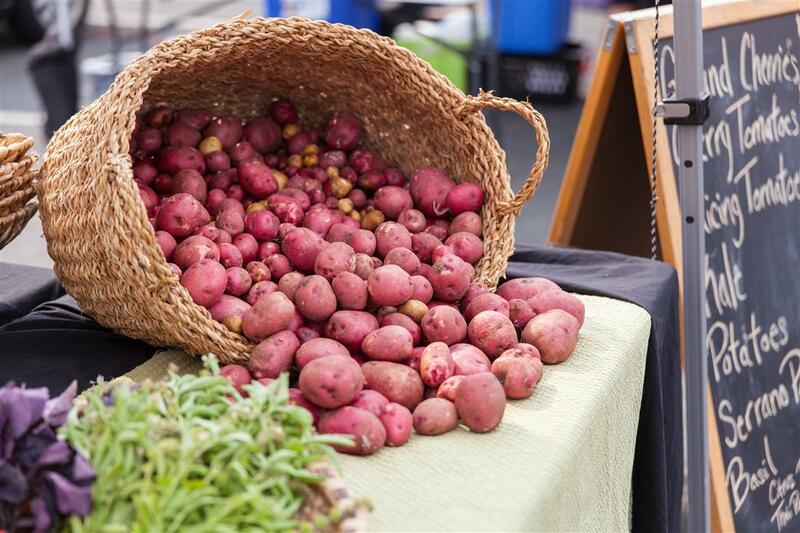 It's all about family, fun and fresh produce for Rosemount Farm. 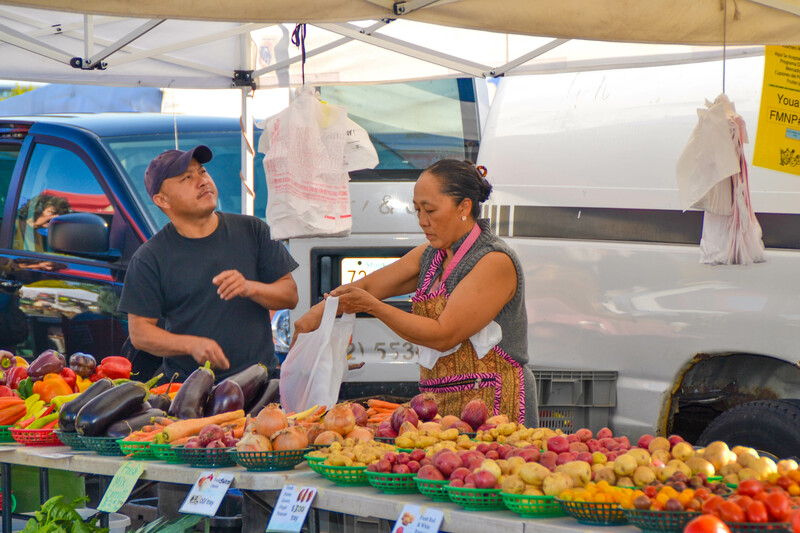 Yia Thao and family enjoy the upbeat setting of the farmers market both for themselves and their shoppers. They love to share their homegrown vegetables and fresh cut flowers and hope customers have as much fun at the market as they do. Ron Shimanski likes to set goals. 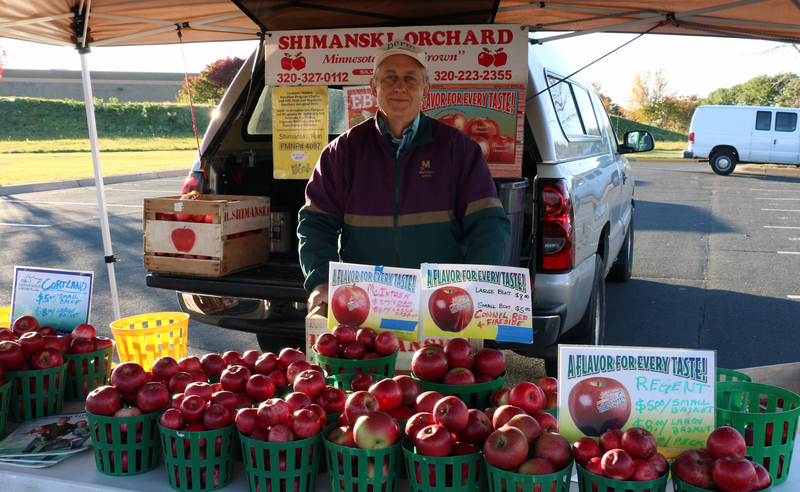 He had the goal of owning his own orchard, which he accomplished in 2003. 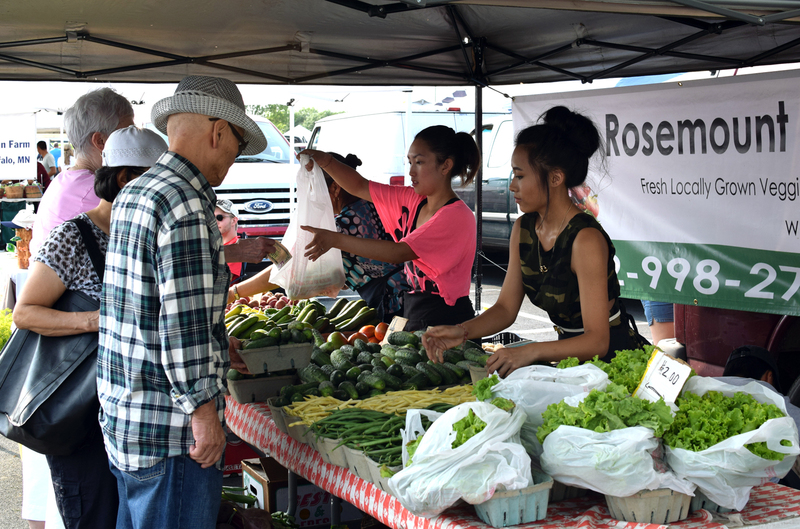 His goal at the Maple Grove Farmers Market is to make the customer happy and that they get to know him, his family and the produce he sells. That produce just happens to be tree-ripened apples, pears, and plums that are fresh picked for each market. 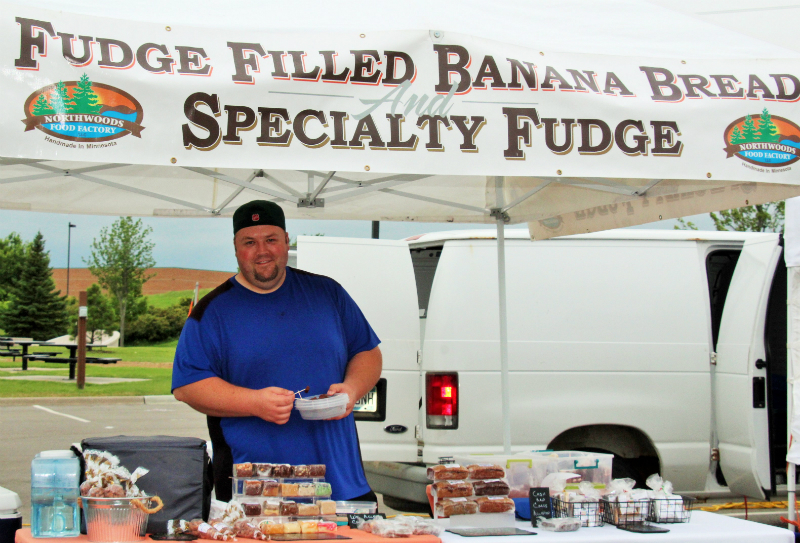 He's been with the Maple Grove Market since it began and especially enjoys the friendly customers and vendors as well as the fast pace of market day. 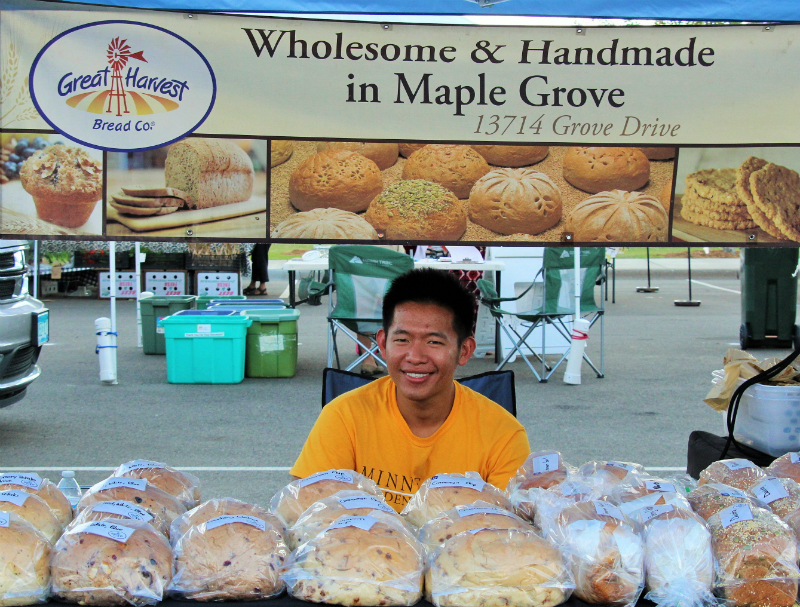 Nhia Thao started selling at the Maple Grove Farmers Market in 2005, mentored by his brother who is also named Nhia Thao. Since that time Nhia and his wife Youa have enjoyed selling fresh produce as healthy offerings to market customers. The Thaos appreciate that working at the farm is good for their health, too. 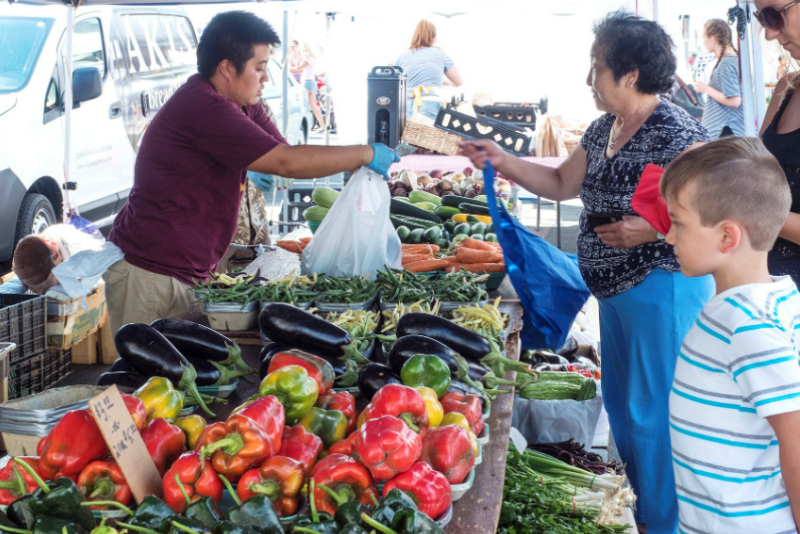 Find a wide variety of fresh produce at the Thao Farm stand each week, including Asian vegetables. 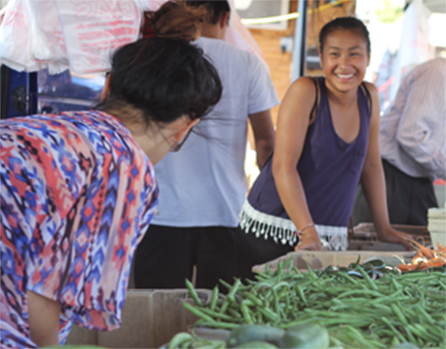 Sharing their hard work at the farmers market means a lot to Xeng Vue's family. They love offering healthier and better food choices with their homegrown, fresh picked produce. Farming is really a family effort involving both parents and children. It's what they know and keeps the family working together to bring the very best product to their customers. The Yang family began growing their own food in 2001 and quickly realized they wanted to farm more acres and share with more people. We're lucky they did! They enjoy both aspects of being a market vendor -- growing and selling. Yang's Fresh Produce offers a wide variety of produce grown using chemical-free methods. 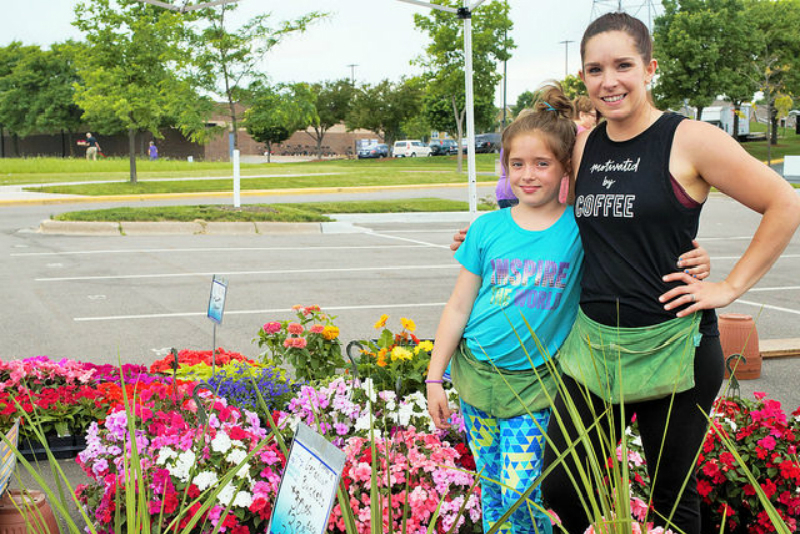 They love the family-friendly atmosphere of the Maple Grove Farmers Market and are happy to be a part of the outdoor setting that is so convenient for the customers. Theresa Eicher and her husband Jerry have fulfilled a longtime dream in their 20-acre hobby farm in Avon, MN. Theresa loves spending time with the goats (or as Theresa calls them "the girls") whose milk is used to make goat cheese in a variety of flavors. That milk is also crafted into scented and unscented soaps and face and body creams. The Eichers also sell may cuts of goat meat. Find Eichers Hobby Farm products at the Grillin' Meats booth during the market's 2018 season. Josef Abel Meats became available at the market in 2015. 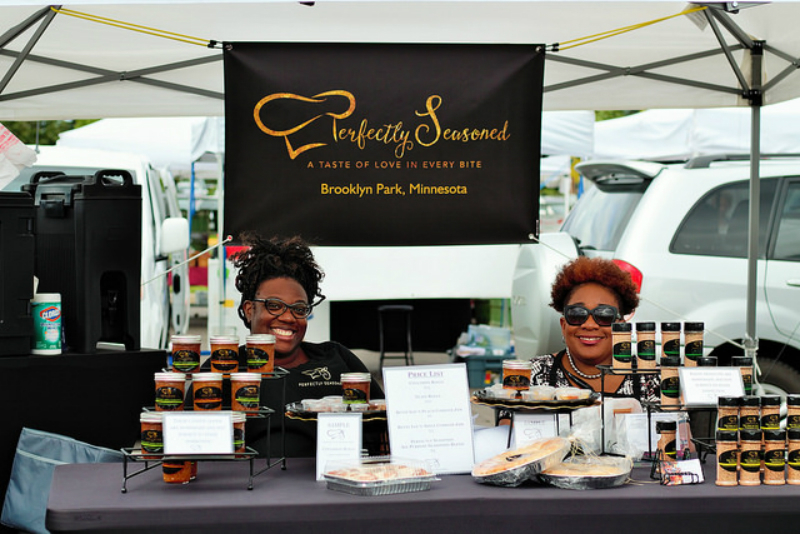 Owner Debra Brand enjoys sharing a natural and delicious alternative in smoked meats. Her jerky and beef sticks are fresh from the smoker in Foley, MN. They are gluten-free and do not contain nitrates or MSG. "I love the laid-back nature of the market. Our customers become our friends." A longtime staple on the Twin Cities bread scene, Breadsmith products have given simple pleasures to their customers for over 20 years. From their storefronts to farmers markets, Breadsmith uses the highest quality ingredients to create hand-crafted breads made from scratch and baked fresh daily. They have a strong focus on taste and freshness, and it shows through in their wide array of offerings. If you ask around, you'll find that everyone has a flavor favorite - it might be a french boule, honey wheat, english muffin bread, or a pretzel or scone or sweet bread. So many choices adds up to lots of flavor and lots of freshness at the Maple Grove Farmers Market. Through her own personal experience with celiacs, Abby understands the challenges of finding delicious products. Her mission is to help others who have food allergies enjoy the food they eat and feel amazing again. With high quality ingredients, Abby follows a careful process to ensure tasty gluten- and dairy-free breads, baked goods, and baking mixes that can be enjoyed by all. 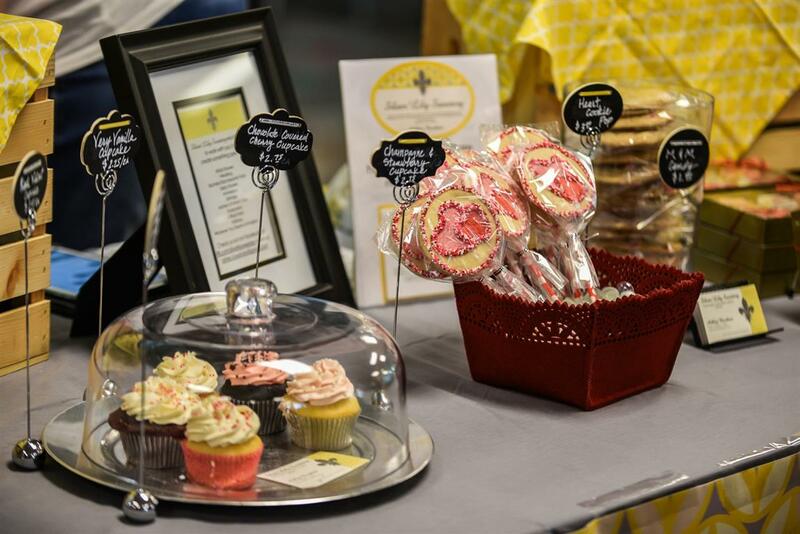 Ashley Boeshans is a baking entrepreneur offering made-to order cupcakes, cookies, and sweet treats. Ashley's business launched in 2015 and she takes great joy in designing beautiful seasonally themed goodies. A portion of each sale is donated to Second Harvest Heartland's Summer Food Service Program, offering lunch to hungry kids in the summer months. Florence Aymard learned to bake crepes under the tutelage of her grandmother in France's Brittany region. Today the recent Paris-to-Minnesota transplant owns and operates her own food truck. 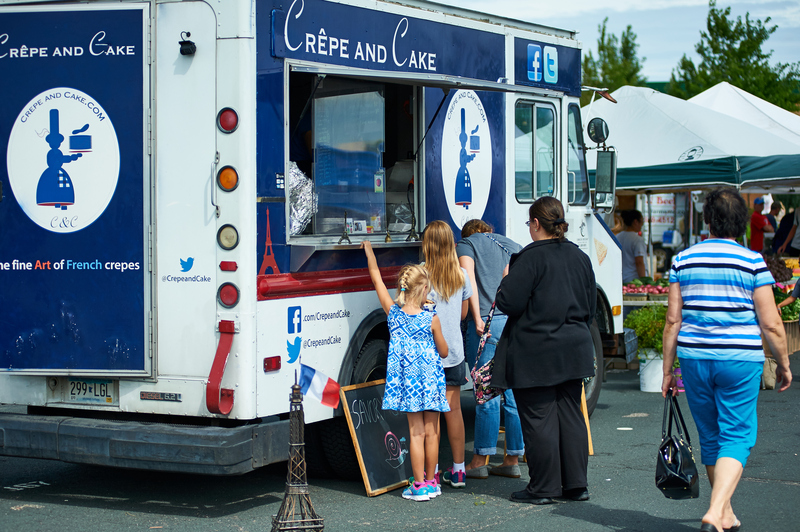 Enjoy a savory or sweet crepe, hot and ready-to-eat, at the farmers market. Bon appetit! Great Harvest is your neighborhood, family owned, community focused, old-fashioned Maple Grove bakery. Each morning, well before dawn, you’ll find them grinding Montana wheat into whole wheat flour on their stone mill. Great Harvest hand-crafts each loaf of bread from scratch. Their moto? Be loose and have fun, bake phenomenal bread, run fast to help customers and give generously to others. Stop by to say hello and pick up a loaf on your next visit to the market! L'Aurelle blends traditional southern style with a contemporary twist. The family recipes used in her baked goods, jam, and seasoning blend are reflective of time spent in her grandma's kitchen. Family is the foundation of Perfectly Seasoned, and L'Aurelle's tasty offerings are steeped in the traditions of food, faith, and flavor. A local bakery that's bringing you a little taste of home and strength to our communities. Roxie and family strive to bring you the simplest, yet tastiest treats that they can make. Many of the recipes are old-fashioned, but without a lot of unnecessary ingredients. Everything is made with love! 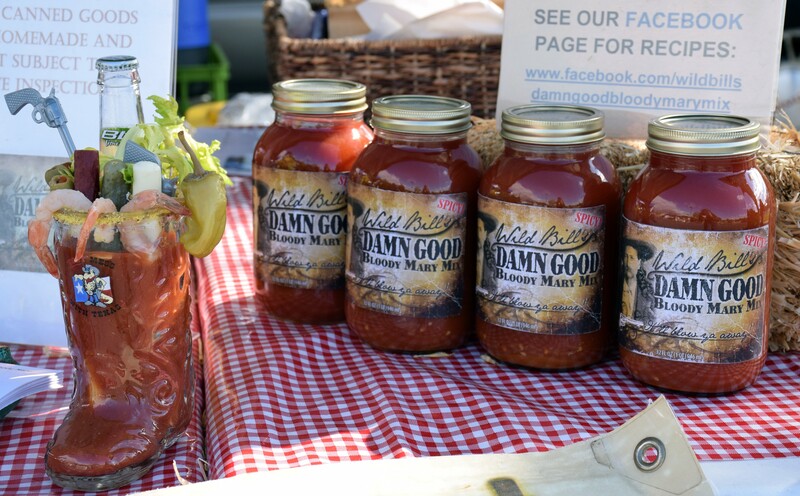 A small start with a big future - that's how Mary and Bill see their bloody mary mix business, which was born by entering a contest. Made in batches of 100 jars at a time, they have a secret ingredient that gives it a little kick. 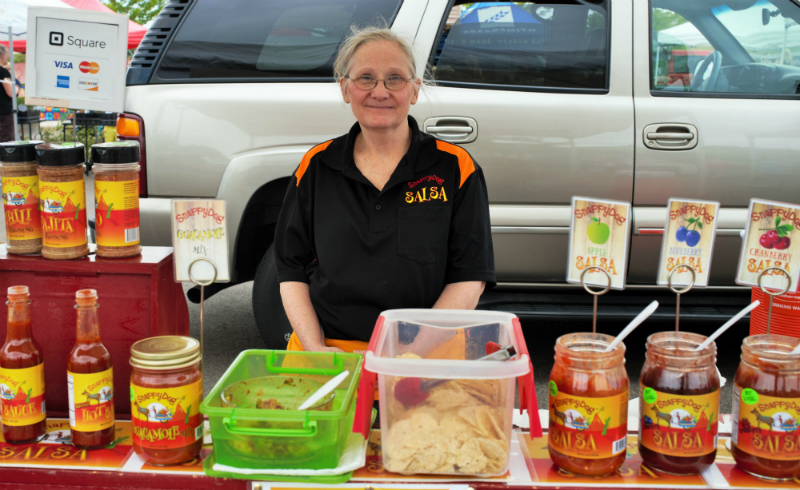 They love sharing their spicy mix at outdoor venues like the farmers market, meeting people and making them smile. They especially appreciate the great friendships and customers. 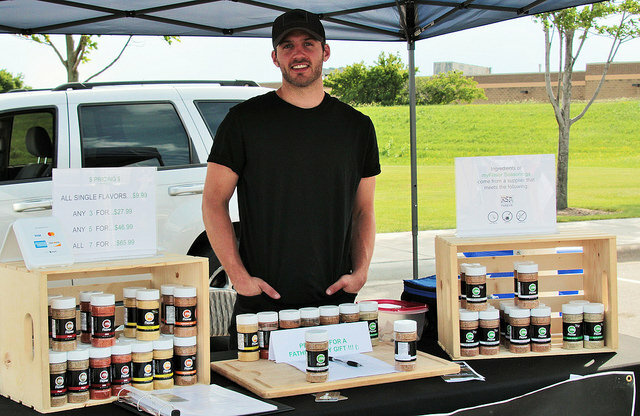 myFlavor Seasonings was created after owner, Dylan Chambers, began experimenting with homemade blends to add more flavor to healthy foods. Healthy cooking is Dylan’s passion and he hopes that his unique blends of seasonings will help other people enjoy flavorful, healthy eating and meals. All myFlavor Seasoning products are low sodium/no preservatives/no MSG, without compromising the taste, texture, and flavor. 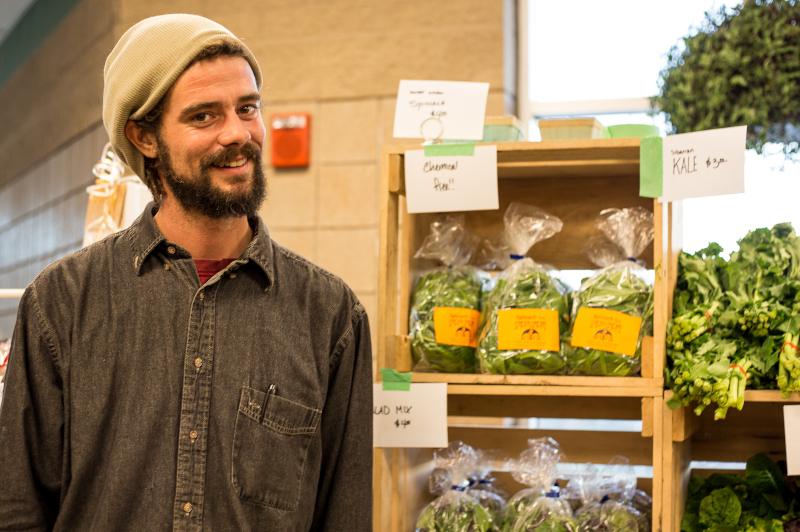 Dylan loves to meet people – stop by the market and say hello! The Northwoods Food Factory is located in north woods of Minnesota, where they create some of the most delectable artisan desserts the old-fashioned way. By hand. In their kitchen. In small batches. With love and care and pride. They create desserts that become the finishing touch to gourmet meals. Stop by to try one of their tasty treats! Unwilling to leave well enough alone, and after years of recipe refinement Sauce Science brings a line-up of hot sauces that will give any dish the kick and flavor it needs. 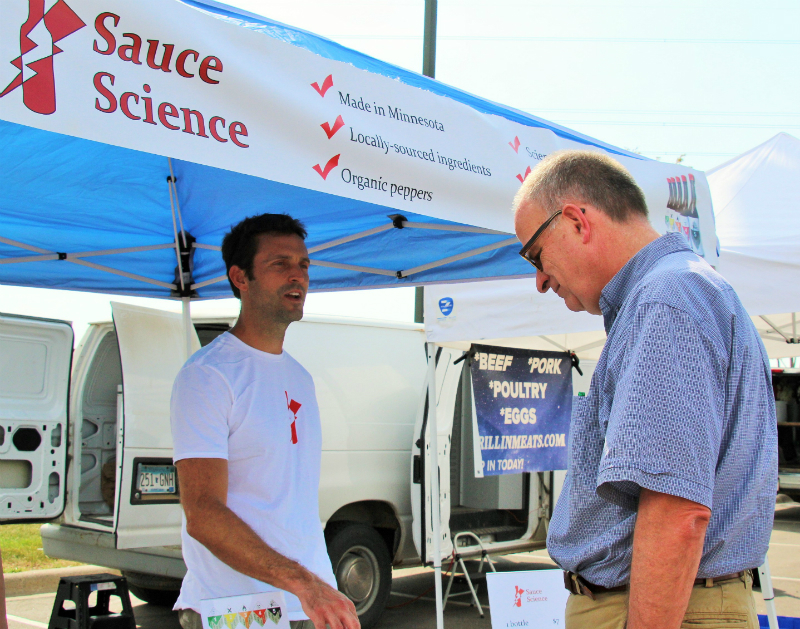 Sauce Science uses analytical methods to engineer spectacular hot sauces in a range of heat levels (trust the numbers!) made from organically and locally grown hot peppers. They also donate a portion from each sale to benefit STEM (Science Technology Engineering and Math) education to make sure the budding scientists of the future have the same or better opportunities as they did. Stop by to try some next time you’re at the market! SnappyDog Salsa, owned by Dave Merten, began business in 2008 with just 3 flavors of salsa: mild, medium, and hot. Since then the salsa brand has expanded to include unique flavors like apple, pineapple, cranberry, raspberry, blueberry, mango, extra hot, peach, and customer favorite, rhubarb. SnappyDog is hand crafted in small batches, which allows them to keep the homemade flavor, as well as quality and freshness. Laura Akre created Fountain of Juice after seeing the positive impact that juicing had on her health. Laura credits whole foods juicing as a cure to the chronic stomach pain she previously suffered from. 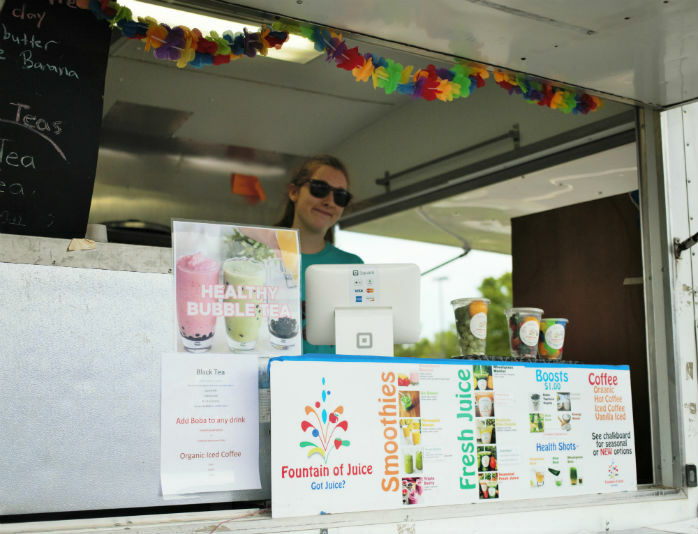 Fountain of Juice serves fresh, made to order, cold press juices, whole food smoothies with no syrups or added sugar. Pick up a refreshing drink next time you’re at the market! 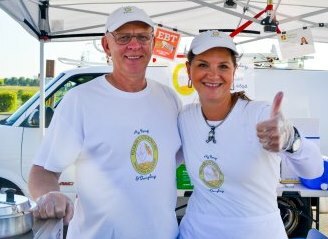 How sweet it is...selling premium ice cream comes naturally to Jim and Robyn Seitzer who enjoy working outside sharing their tasty treat. Their product is made in select flavors with liberal amounts of cream and milk that give it the "good old-fashioned taste." 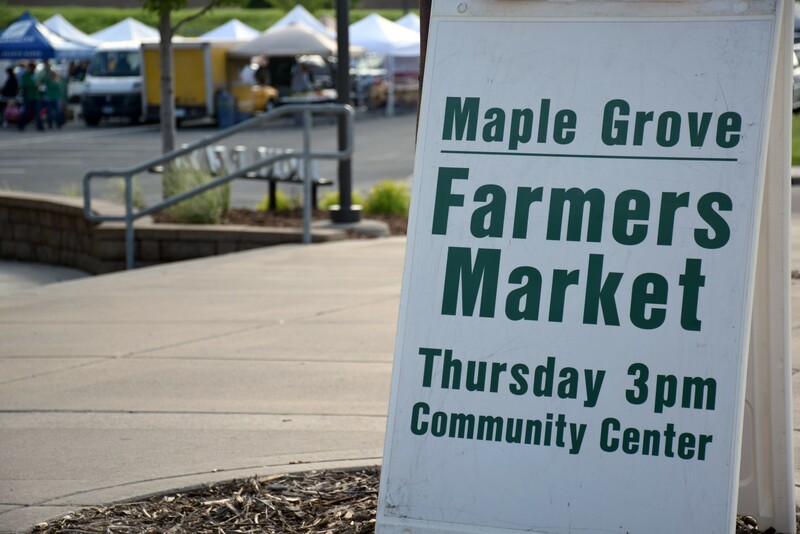 Maple Grove is the largest farmers market they participate in, and they enjoy and appreciate new and loyal customers. 100 years ago Viviana Gurdian’s great- great- grandmother, Lucila Duval de Morales, carved out a coffee farm in the Central Valley of Costa Rica. Today, Viviana's father manages the farm, Hacienda Miramonte (Willows Coffee). More than just another coffee producer and a place to work, their business represents a century of commitment to traditional harvesting practices, good wages and living conditions for their employees and their families. Viviana and her family believe that coffee has the ability to make your life better and they want the world to know what great coffee tastes like. Stop by on you next visit to the market to enjoy a cup. Looking for natural soaps for your household? 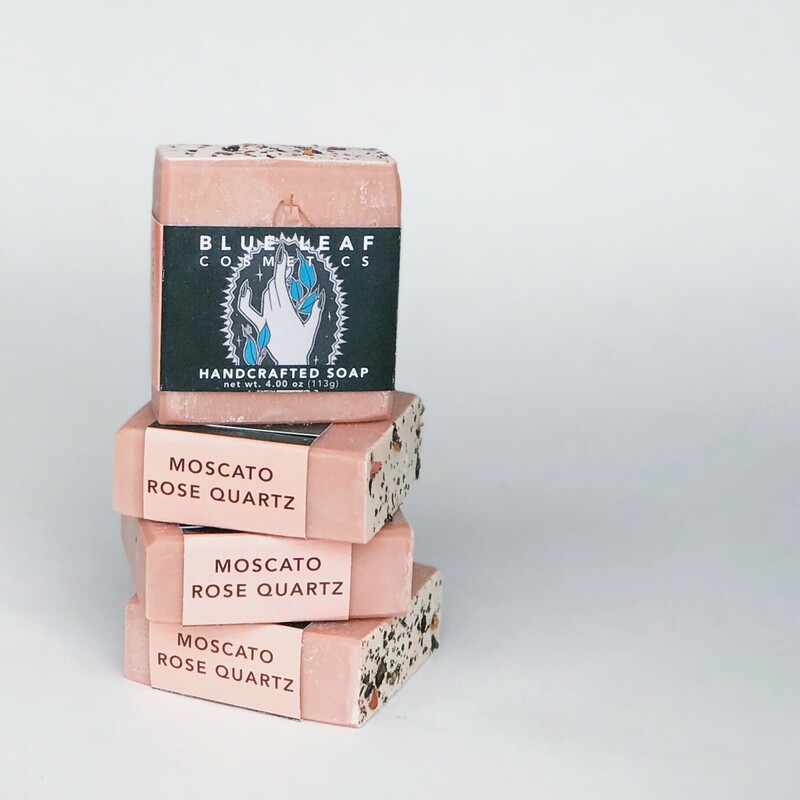 Be sure to check out Blue Leaf Cosmetics during your next visit to the farmers market. Owner, Mallory Leider, started making her own skincare products 10 years ago when her son was struggling with eczema. Mallory’s simple list of ingredients worked wonders on her son’s skin and she’s never looked back. A few unique facts about the soaps? They are vegan, free of palm oil, and 94% natural. 2019 vendor applications my be completed online. 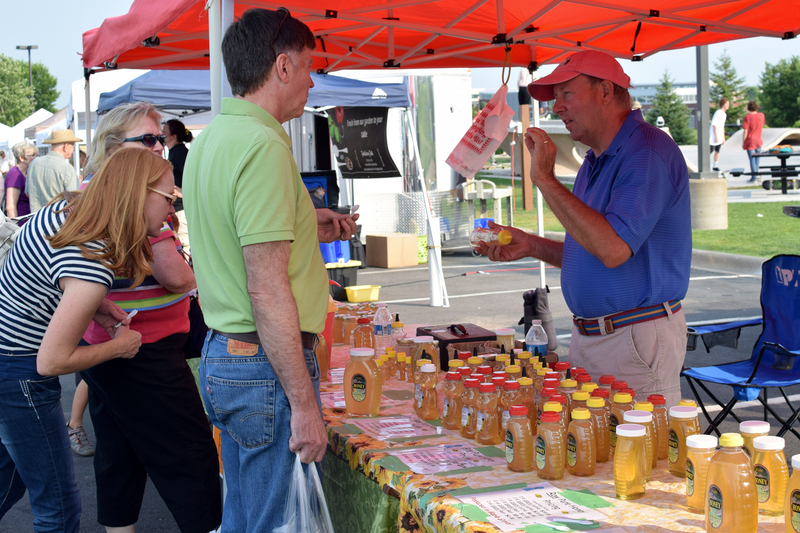 New vendor applications are considered until the market is full. We are looking for unique, high-quality local products that best complement current offerings. Thank you for your interest in becoming a vendor at the Maple Grove Farmers Market. Call 763-494-5955 for more information. Please note that non-edible, non-consumable arts and crafted items do not meet market guidelines. In addition, we do not accept any home party, consultant type businesses, or fundraising activities.